How frustrated are you by the seemingly never-ending string of bizarre weather records, towns underwater, Atlanta experiencing pre-Walking Dead conditions from a few inches of snow? I couldn’t be more ready for the subtle hints of spring upon us, an unseen bird whistling mid-morning; the sun a bit closer, less removed, seeming to reenter the atmosphere; a few days in a row running out the door with only a decent jacket. But the blasted groundhog says we’ve weeks to wait–even though our forecast in Memphis this weekend boasts a couple days with highs breaking 60 degrees–so I’m keeping recipes like these close. 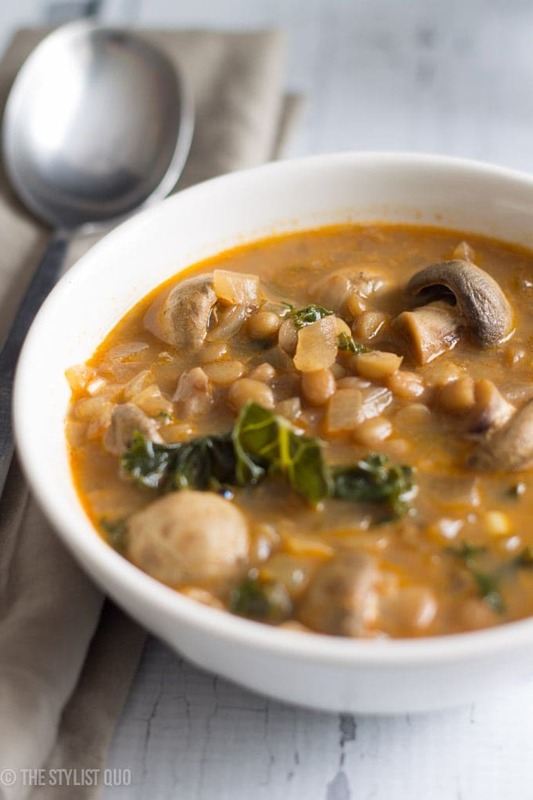 This soup is perfect for those wintry nights when you’re just tired of the cold and need something easy and filling without being too heavy. I’m not as in love with lentils as being a vegetarian/vegan dictates I be, but in this spiced, creamy soup, they’re perfect tender little pucks, filled with fiber and protein. 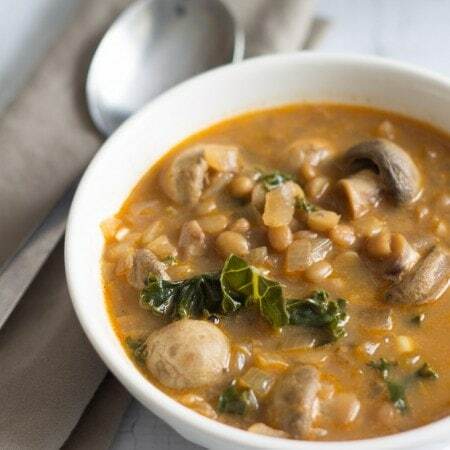 You’ll love this soup because of the warming spices, basking in the cool, creamy coconut milk; the tender kale backstroking in the broth; the earthy mushrooms left whole for maximum flavor, marinated with the flavorful bisque. You can cook the lentils in a pressure cooker to speed up the overall recipe time, but the simmering of the lentils is so inactive I don’t mind it. You can also use canned lentils if you have them to cut out that cooking time altogether. Make this! It’ll warm your shivering bones. 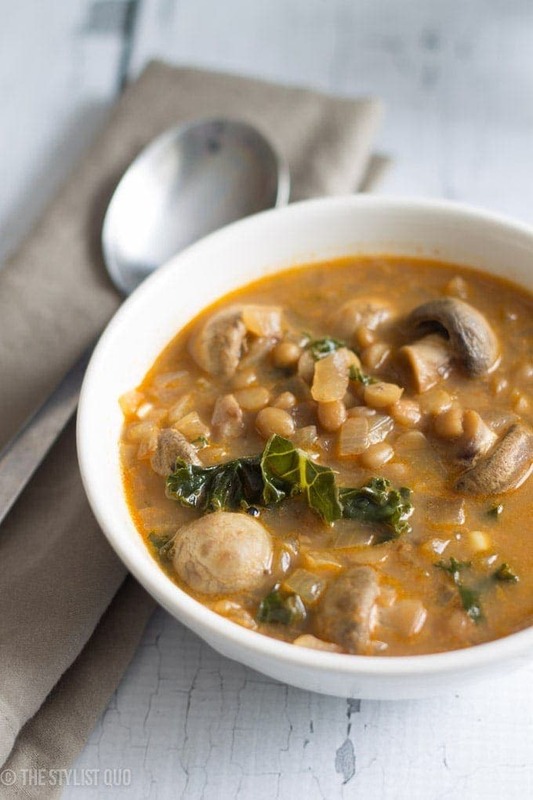 A warming soup, packed with lentils, mushrooms, and kale in a rich, coconutty, spiced sauce. Rinse the lentils in a colander and pick out any stones. Combine them in a pot with 4 cups stock and bring to a boil. Reduce the heat and simmer until the lentils are tender, about 20 minutes. Meanwhile, heat the oil or ghee in a medium skillet and sauté the onion over medium heat, stirring frequently, until browned in spots but not burnt, about 10 minutes or so. Add the garlic and spices and fry until aromatic, about 30 seconds. Scrape into the lentils and add coconut milk, kale, and mushrooms. If soup is too thick, add up to 2 more cups stock. Bring soup back up to a boil then reduce heat to a simmer and let cook for about 10 minutes, or until mushrooms are cooked and kale is tender. Add salt to taste. I just made this for the third time. It’s so ridiculously good. I make it in a pressure cooker, so the cooking takes about 15 min, not including cooldown, which is another maybe 10-15, unassisted. It’s nice because I can walk away and do other things. But I am a lentil soup fanatic, plus a lover of Indian food, so this recipe is pretty much my dream come true. THANK YOU! I just made this soup tonight as I had open packages of mushrooms, coconut milk, and stock to use up. I didn’t have coriander so I just left it out. OMG. It was amazing. Full of flavor, easy and quick to make, and absolutely delish. Thanks for the recipe! Oh, yum! I have everything on hand except for kale, will be substituting spinach as “cook” did. So looking forward to this one, thank you for sharing! I just finished making this and it was GREAT! No kale on hand so I substituted spinach. Very flavorful, hearty, and simple to make. I’m so glad you liked it!! I found it be a very simple yet flavorful soup for a winter night 🙂 thank you for taking the time to comment, too! Wonderful looking soup Cheryl, great job!